Rita Mitra Mustaphi is a native of Kolkata, India. Under her direction, Katha Dance Theatre is distinguished by its impeccable technique, its capacity to expand the Indian classical Kathak dance vocabulary and realize new works, and its collaborations across disciplines. 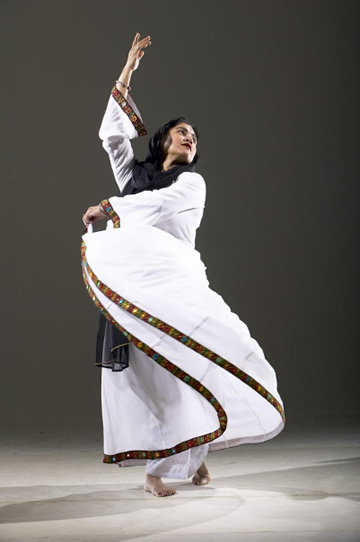 From 1987 to 2005, while promoting traditional Kathak dance through various dance dramas, she became interested in cross-cultural exploration through collaborations that she continues to pursue today. In her 30+ years as a professional dancer, she has choreographed more than 50 new works that performed locally, nationally and internationally. Her selected awards include three McKnight Fellowships for choreography and dance from the Minnesota State Arts Board, a leadership award from the Council of Asian Pacific Minnesotans, a 2011 Lifetime achievement award from the India Association of Minnesota and a 2012 Education Award from the Ordway Center for Performing Arts in the category of Excellence in Vision. In 1994, Mustaphi was a company member at the Guthrie Theatre and has performed as a troupe member of Pandit Birju Maharaj at New York’s Carnegie Hall. She performed at the prestigious international Kathak Dance Festival in New Delhi, India in 2003. The festival was organized by the Kathak Kendra, the National Institute of Kathak dance in India. Adept in the classical Kathak vocabulary, her works are infused with contemporary sensibilities acquired from her intense interest in expression, rhythmic works and movement idioms. Her work covers an impressive range, from virtuoso traditional exposition of Kathak dance, to large-scale and arresting adaptations of classics, to boldly innovative creative collaborations with choreographers, designers and musicians. She sees dance as a primary medium of artistic discourse, and through her gift for metaphor she combines poetic and emotional meaning into a satisfying creative blend.